Looking for portable storage containers at competitive prices? Haulaway has got you covered. If you’ve been keeping an eye out for affordable storage containers for sale, our proprietary portable units are a fantastic option. They come in a variety of sizes to match any need, from ten feet to forty feet, with options for customization and our patented security lock system. For a very reasonable cost, you can have a mobile storage container delivered directly to your home or business. Rather than spending an arm and a leg looking for shipping containers for sale, try this alternative. We’ll make sure you don’t regret it. You may be invested in finding storage containers for sale so that you can own your container outright, but this can come with complications. You might not know the entire history of the container or whether it has any issues, particularly if you’re buying used from a private seller. Storage container prices can be all over the map, many of them reaching up into the higher stratosphere cost-wise. Once you own the unit, it’s your responsibility to move it or sell it if the need should ever arise. What if your requirements change and you need a bigger unit? When you work with Haulaway, those issues fall by the wayside. 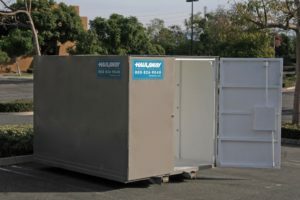 You’ll find a mobile storage container that exactly matches your requirements, including custom sizes. We’ll deliver the container directly to your home or business and pick it up when you no longer require it, which is ideal for temporary storage. Mobile storage units are versatile and much more affordable than paying regular moving costs or rent for a pricey permanent storage unit. Whatever your needs, let Haulaway help. Our storage containers have reasonable prices and can be delivered anywhere you need them from one of our many facilities across the nation. Contact us today to discuss your needs or ask any questions!